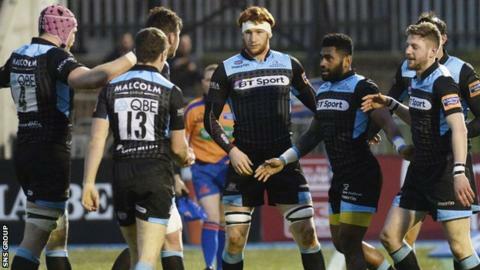 Former coach Sean Lineen says Glasgow Warriors are well placed to win the Pro12 title for the first time. Gregor Townsend's team are guaranteed a play-off place - and wins in their final two league games, away to Treviso and home to Zebre, should be enough for a home tie in the semi-finals. "I think they have one of the strongest squads, if not the strongest, in the competition," Lineen told BBC Scotland. "They are hungry and I think this is their time." New Zealand-born Lineen, 52, saw his six-year reign end with play-off semi-final defeat by Leinster in 2012. Townsend got to the same stage and lost to the same opponents in his 2013 debut season. Both of those defeats were in Dublin and Lineen thinks a home semi-final can make a difference this time. "Coaches will say it's not that important, but it is," he said of the venue. "It would be a great shot in the arm for Scottish rugby and fantastic for the Glasgow faithful. To get 12,000 or 13,000 at Scotstoun would be amazing. "It's what the players and coaches deserve. For the past few years Glasgow has flown the flag for Scottish rugby. "The semi-final would most probably be against Munster and I honestly believe they can win it." Six consecutive wins has taken the Warriors to second place, with the remaining league matches against the sides propping up the table. "They have created the opportunity and won't want to let it go," added Lineen, who is Scottish Rugby's head of player acquisition. "They have been together for a few years now and added some canny signings with Niko Matawalu and Josh Strauss. "If you look at the players who aren't starting against Treviso, it just shows how strong the squad is. I honestly believe they can go on and win it. "Treviso are a tough nut and they are vying with Zebre for Italy's one European Cup spot for next season. "But Glasgow are going great guns at the moment. I've been to the last couple of games and really enjoy the way the play for each other. "Gregor has really done a great job. The building blocks were there but he's a clever lad and has a good coaching team with him. "The players are playing for him and each other. The momentum he has gathered is brilliant and it's great for Scottish rugby."